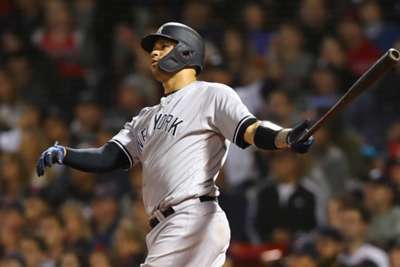 The New York Yankees did exactly what they needed to do, stealing one from the Boston Red Sox at Fenway Park in a 6-2 win in game two. Gary Sanchez went two for five with two home runs and four RBIs. His second homer soared a massive 479 feet and put the game away. Masahiro Tanaka got the win while David Price once again struggled in the playoffs. The win saw the Yankees level the American League Division Series (ALDS) at 1-1. Once your team has made the playoffs, your regular season record and ERA do not matter. That is the big knock against Clayton Kershaw in his career. He is one of the most dominant pitchers of all time before the postseason, but he is not quite as good when the games matter most. Price and Tanaka are perfect examples as well and that was on full display in game two on Saturday. Price's teams have never won a playoff game (0-10) when he has started even though he holds a 143-75 regular season record with a 3.25 ERA. Price was awful Saturday as he allowed three runs and two homers before he was removed just 1.2 innings into the game. Tanaka was very good, surrendering just one run in five innings of work. Tanaka now has a 1.50 ERA in 30 career postseason innings. Over the last two seasons his playoff ERA stands at 1.38 after he posted a combined 4.28 ERA in his last two regular seasons. What matters is that his team are one win closer to winning the ALDS, not his regular season ERA. Piggybacking is when a team will start a pitcher, have them throw about 75 pitches and then bring in another starter behind them to throw 60 pitches and close out the game. The hope is one pitcher goes five innings and the other finishes the last four. Many pointed out that Red Sox manager Alex Cora saw Astros skipper A.J. Hinch use starters out of the bullpen to his advantage on the way to a World Series win last year and copied it with Boston this year. He used Rick Porcello in game one and then Eduardo Rodriguez in game two. The issue here is Houston had prepared for that situation for a long time, while the Red Sox kind of did for about three or four weeks. Porcello and Rodriguez made a grand total of one appearance out of the pen in the minors. Rodriguez had four at the MLB level. To say what the Red Sox are doing is equal to what the Astros did is not entirely accurate. Houston prepared for it for years, the Red Sox kind of implemented it over the last month, which may be why Rodriguez gave up three runs in 1.2 innings in game two and Lance McCullers Jr., Charlie Morton and Brad Peacock went a combined 20.2 innings with a 3.04 ERA and 26 strikeouts in relief outings last postseason. For obvious reasons it was great the Yankees split these two games at Fenway Park. Stealing a win on the road in a playoff series makes life a whole lot easier, but it is especially big for the Yankees for several reasons. New York were 6-3 at home against Boston this year. Over the last two postseasons New York are 7-0 at Yankee Stadium in the playoffs. The Bronx Bombers hit 21 more home runs at home this year, scored 55 more runs, batted 22 points higher and got on base at a much better clip as well. This is the best home field advantage in all of baseball and New York could send the Red Sox packing after game four if Boston are not careful.